Discover the amazing power of physics through its applications! Learn all about lasers, super strong magnets, solar cells, biosensors and more. 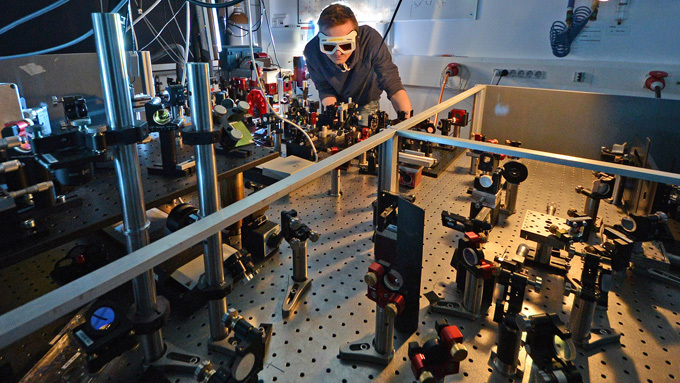 Applied and Engineering Physics Master student at state-of-the–art ultrafast laser: investigation of ultrafast processes in atomes, molecules and solids will advance material science, information technology, solar energy harvesting, and bio-medical applications. Foto: TUM.PH Kienberger Lab. The Master's degree program in Physics (Applied and Engineering Physics) is a two-year international graduate program, designed to give students an insight into current research trends and new developments in modern physics. Energy sciences -- including topics such as fuel cells, energy conversion, reactor physics and nuclear technology, nonlinear dynamics and complex systems, renewable energy. Experimental techniques and numerical methods - including topics such as physics with neutrons, modern x-ray physics, advanced materials analysis with synchroton radiation, magnetic measurement methods. High energy physics -- including topics such as particle detectors, particle physics with highest energy particle colliders, computational physics, data analysis and Monte Carlo methods. Medical engineering -- including topics such as image processing in physics, biomedical physics. Nanosciences -- including topics such as nanosystems, nanomaterials, nanostructured soft materials, surface and nanoscale science. Plasma physics -- including topics such as plasma physics, fusion research, kinetic plasma physics, magneto hydrodynamics, turbulence in neutral fluids and plasmas. Soft matter science -- including topics such as polymer physics, nanostructured soft materials. Science of light -- including topics such as quantum optics, ultrafast physics and attosecond science, various light sources from infrared to X-rays, optoelectronics, ultra cold quantum gases. The study program of the first year of studies can be organized individually. The following study programs show examples of how the first year of the Master's degree program Applied and Engineering Physics could look like.